278/365(+1), a photo by Luca Rossini on Flickr. Today I fully experienced what being the country of fashion means. 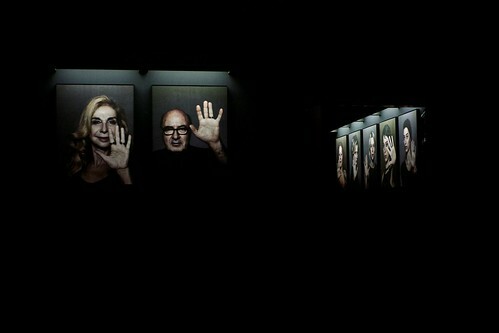 Bulgari organized at Palazzo Pecci Blunt, in the hearth of the city center, the exhibition of Fabrizio Ferri’s “Stop. Think. Give”. The work consists of more than one hundred thirty portraits of celebrities, all raising their hand to say “Stop, take a look, think about it and give your contribution for a better world”. They all wear Bulgari’s Bzero1 ring, because the company gives part of the revenues (it has already donated 20 millions of dollars) to Save the Children, the largest international independent organization active to improve the quality of life of children worldwide. At the vernissage most of the portrayed celebrities were present, plus most of the fashion industry protagonists. The place was gorgeous, the photographs incredible, the people stunning, the atmosphere unbelievable. I had a chance to say ciao to Ferri, which, besides being a god of fashion photography (he took, for example, one of my favorite shots ever, the one of Monica Bellucci licking honey on her face), is a really nice guy. Then we met with our new client, the one which is introducing us into the world of fashion, and had a couple of drinks. I don’t need to tell you, I don’t think I’ll be able to sleep much tonight!